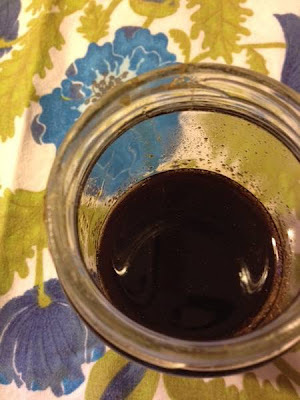 I made this Spiced Syrup with the intention of using it in my coffee. Kinda like a Gingerbread Latte Syrup? But that just tasted weird. It overpowered the taste of the coffee and tasted mostly sugary and kinda sandy from the powdered spices. I think I know what to do next time to avoid these issues! *** But in the meantime, I can't just throw this lovely stuff away! It was delicious drizzled in apple oatmeal. It also transformed my vanilla frosting into a vanilla chai frosting! What a YUMMY success that was! It's also great to make chai tea! 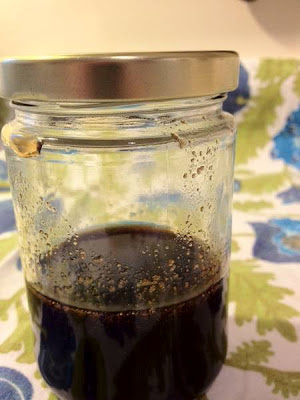 Just Make a pot of strong black tea, like English Breakfast or Darjeeling, and stir in some of this syrup! Add milk if you want. Combine all ingredients in a small saucepan, except for the vanilla extract. Bring to a boil, uncovered, and then reduce to a gentle simmer until the watery mixture thickens. This should take about 15 minutes. Add the vanilla extract and continue to simmer for another few minutes. Allow syrup to cool in the saucepan and then transfer to a glass jar and store in the refrigerator. Yields about 1 cup of gingerbread syrup. *** As I mentioned in the beginning, this syrup wasn't great in coffee. Next time I would make very strong fresh chai tea from scratch using whole spices like cinnamon sticks, freshly grated nutmeg, allspice balls, cloves, peppercorns and fresh ginger. Similar to this recipe. I would allow the tea to steep until the water tasted very strongly of chai spices. I'd strain out the spices and then proceed with the rest of the recipe! Or maybe I'd try really nice tasting store bought chai tea bags? Hmm, I wonder how this would go on pancakes or waffles. We're always looking for variations on maple syrup, and this is so unique! Hi blessedmama! I just went and tasted a tiny spoonful of the syrup to see if I could imagine it on waffles and pancakes! And my answer is yes! I think that it would be delicious! What a great idea! Going to try it next time!